Easy Job Portal in USA. in making things easy and simple for recruiters.How many sites gives you automated features. its focus is to make things easy for everyone. It believes in simple and easy design and user interface. It is totally free and public job site. 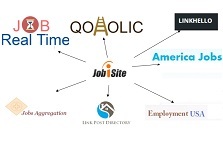 Why Jobisite.com is called easy job portal? -Simple registration, no hidden stuff. –Post job by simply sending email. -Just add the email address to your emailing list. -Sit back and relax. Job will be posted to few other job portals also. –Get suggested resumes in your email. -Simple and easy resume search. -Create question paper online and shortlist your candidates. No need to make phone call. among recruiters because of their unmatched benefits. If you are using jobisite,it really gets simpler when you have to hunt for resources.